I don't know about you, but I am so thankful that God is good and that His love endures through it all. And I mean through it all. He loves us when we are naughty and nice. He loves us in our best moments and our worst moments. He loves us in our highs and in our lows. He loves us when we don't even love ourselves. More so than being thankful for our country today, I am thankful for our great God. As my Pastor wrote yesterday, "It's good to thank God for your country this Thanksgiving. But let's never forget that our God is a global God." I have so much to be thankful for and I try my best to be thankful every day. Psalm 100:4 says, "Enter His gates with thanksgiving; go into His courts with praise. Give thanks to Him and praise His name." I find the more I am thankful every day, I do less complaining and have less to want. Why? Because God has given me so much, a lot of which I don't even deserve. He's given me a wonderful husband and three healthy, beautiful and talented children. God has always provided a roof over my head, clothes on my back and food in my belly. God has provided me with health even if I don't always take care of my own body. God has placed me in a country where I am free to openly worship Him. He has blessed me with a church home and a church family that believes in teaching the Word of God. God has blessed me with friends around the world. And best of all, He willingly sacrificed His son on the cross for me and for you so that those who believe in Jesus as their Lord and Savior could receive the gift of eternal life. I pray that today is a day filled with thanks to our great God for whatever it is that He has provided and blessed you with. 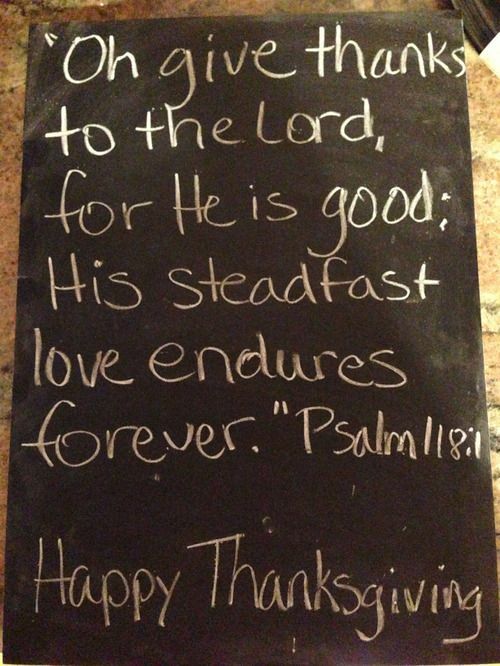 Give thanks to Him today and praise His holy name.